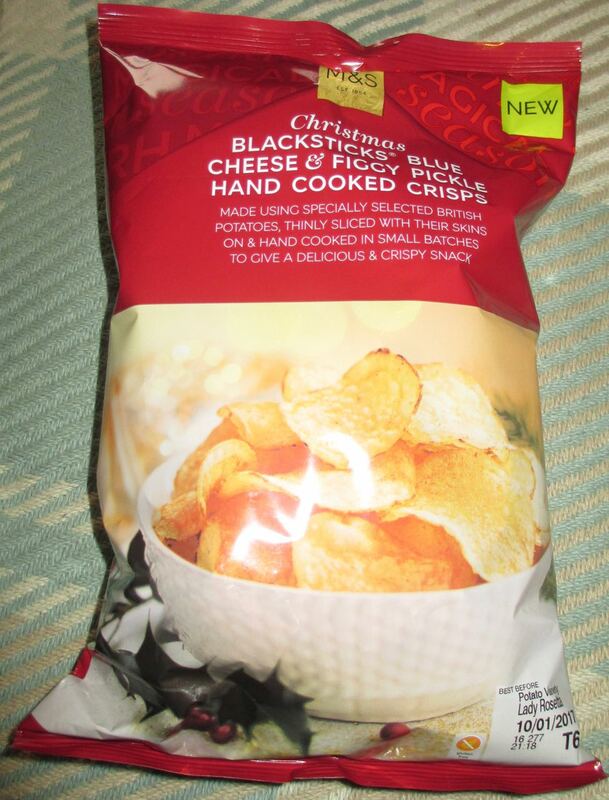 This is another new flavour of crisps added to the Marks and Spencer Christmas line. The flavour, Blacksticks Blue Cheese and Figgy Pickle, sounded like a posh cheese and pickle, but with a nice Christmas twist. We are still a little way off Christmas, so we had these with lunch as an accompaniment to smoked salmon bagels, not seasonal, but sticking with being posh! The first thing I noticed when we poured some out was that these crisps were cooked with their skin on and that they weren’t too thickly cut. 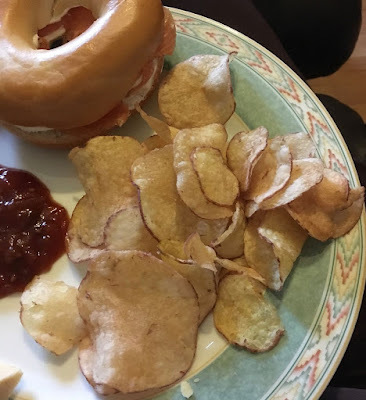 This to me was a revelation, generally the posher the crisps the thicker they cut them. I’m actually a fan of thinner cut crisps, perhaps its just what I’m used to, but it is nice to see a bit of variation in the market. The texture worked well, light but still crunchy. The first flavour to hit is the cheese taste, it is quite strong and the blue cheese aspect adds a lovely loaded cheesy zing. I eat quite a lot of different cheeses, but have to confess to not knowing how strong Blacksticks is supposed to be but from this I’d guess quite strong. I like blue cheese, so found these to be really good cheese crisps, with loads of flavour. The addition of the Figgy Pickle was overtaken by it on some crisps, but on others was very much present. I quite liked this mix of flavour as it meant each crisp was different. The Figgy Pickle added a good balance to the taste, a sweet fruity flavour, with a nice hint of sharp vinegar too. The crisps were very moreish, and if you like cheese crisps, these are absolutely superb.